March 28, 2019 The Borderlands reveal stream is nearly upon us. Despite all we’ve been through over the past few years, Borderlands 3 still hasn’t been announced yet. But that’s about to change, with a reveal stream at PAX East – unless we’re in store for one of the most infuriating bait-and-switch jobs in game reveal history. All signs point to a proper Borderlands sequel reveal today, and you can watch the stream where it’s taking place below. As we all await that Borderlands 3 release date, Gearbox has been teasing up a storm. 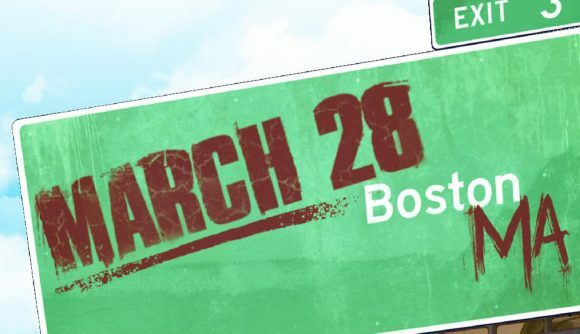 First we had a tweet showing a road sign in the Borderlands style pointing to PAX East (along with the exit number ‘3’), then we got an even more explicit teaser trailer showcasing all sorts of familiar Borderlands characters, and plenty of easter eggs, too. Besides the Borderlands hints, Gearbox has been teasing some other new game reveals at this panel. Some of them appear to be brand-new, and one looks like some kind of Borderlands 2 re-release, though at a certain point the tweets got so vague and trollish it’s tough to tell what’s actually meaningful. You’ll be able to see the panel in full at 11:00 PDT / 13:00 EDT / 18:00 GMT via the Twitch stream below. Some fans have been awaiting a Borderlands 3 announcement since the launch of the second game, and Gearbox boss Randy Pitchford has been teasing that possibility for nearly as long. And to add to the hype, Pitchford himself has been spotted at PAX East in a jacket emblazoned with a massive number three. As of PAX West last year, Pitchford said that 90% of the studio is “working on the thing I think most of you guys want us to be working on.” We’ll (probably, almost certainly) find out what the results have been in about an hour.